John Doe came to Seattle to pursue graduate studies and conduct research in Engineering at the University of Washington. Now he is a plaintiff in a class-action lawsuit filed in federal court in the Western District of Washington today challenging President Trump’s ban on travel by people from seven Muslim-majority nations. The ACLU-WA is representing people with valid student and work visas, including graduate students whose scientific research and career plans have been badly disrupted by the Executive Order. Also represented in the suit is the Episcopal Diocese of Olympia, whose efforts to fulfill its religious mission of serving refugees have been severely harmed by the ban. The suit says the President’s Executive Order on immigration violates the Constitution as well as federal law. “The President’s Order is causing severe and unnecessary hardships to the lives of people who have come to America to study, do research, or work. 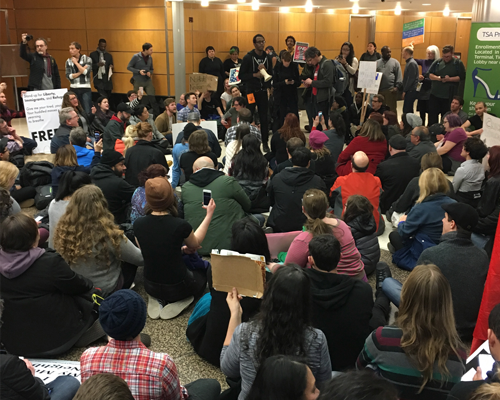 They came to Washington state lawfully and have already been subjected to rigorous screening and vetting by the U.S. before their entry,” said ACLU of Washington legal director Emily Chiang. “The President promised a Muslim Ban and that’s exactly what this is. Our Constitution forbids that type of singling out people who practice a particular religion,” added Chiang. "Receiving and helping resettle refugees from the more than 65 million people who have been displaced by war, violence, famine, and persecution is an essential part of living our faith. The Executive Order has caused significant harm to the men, women and children who are served by our refugee program," said The Rt. Rev. Gregory Rickel, Bishop of Olympia. On January 27, the President issued an Executive Order prohibiting entry or re-entry for at least 90 days for all persons of seven predominantly Muslim nations and barring indefinitely the entry of refugees from the designated countries. Relying on the authority of the Order, the State Department that same day summarily revoked all valid non-immigrant and immigrant visas of nationals of the seven countries. Although courts in Washington state and around the country have granted writs of habeas corpus and temporary restraining orders, Plaintiffs are compelled to file this action to ensure their rights are protected. Many of the existing class actions do not help refugees stuck outside the country, or people with non-immigrant visas who are stuck inside the country. And until there is legal certainty as to the status of their visas, those with non-immigrant visas cannot leave the country no matter how urgently they may wish to since there is no guarantee they will be able to return. Plaintiff John Doe is an Iranian national who resides in Seattle and is a fourth-year PhD candidate in Aeronautic and Astronautic Engineering at the University of Washington. He has a provisional patent pending in the U.S. pertaining to battery function and is also a graduate fellow with the Clean Energy Institute in Seattle. Mr. Doe holds a multiple-entry F1 student visa that allows him to pursue full-time educational study in the U.S. He received this visa after an intensive vetting and screening process abroad that included an in-person interview and proof of his admission at UW as a full-time doctoral student. Mr. Doe’s immediate and extended family, including maternal grandparents, all live in Iran. Mr. Doe is engaged in collaborative research with the Chinese Academy of Science. He co-authors publications with his collaborators, and is actively engaged in advising and directing joint research with students in the U.S. and China. Mr. Doe was planning to return to China for further research and collaboration in 2017. In addition, as part of his doctorate studies, it is expected that Mr. Doe will participate in international conferences, as such endeavors are essential to his training and his ability to be fully active in the scientific and research community. But now, as a result of the Executive Order, he is unable to travel outside the U.S. for fear he will not be permitted to reenter. Plaintiff Jane Doe is an Iranian national who resides in Seattle. Ms. Doe holds a multiple-entry F1 student visa and is studying to complete a Master's degree at the University of Washington. Ms. Doe received her visa after an intensive vetting and screening process abroad that included an in-person interview at the Vancouver consulate, and proof of her admission status at the UW as a full-time student. She dreams of working on international issues, including perhaps one day working for the United Nations. The Executive Order has disrupted Jane Doe's work, study, and goals. As part of her professional training, Ms. Doe was pursuing summer internships outside of the U.S. when the Executive Order was issued. However, because of the Order, Ms. Doe may now not be able to return to the U.S. to complete her studies if she leaves for a summer internship – or even for an internship interview outside the U.S. As a direct result of the Executive Order, Ms. Doe has canceled all of her interviews for summer internships abroad. And without an international summer internship, Ms. Doe's dreams of a career in international work may be permanently on hold and she may have to abandon her graduate studies. In addition, Ms. Doe fears that she will not be able to leave the U.S. to see her family, including her elderly grandparents, and they will not be able to come to the U.S. to visit her either for the duration of her studies. The Episcopal Diocese has operated a refugee resettlement program since 1978 and has sponsored more than 15,000 refugees of all religions and nationalities to resettle in the Seattle area. The program stems from the moral obligation of the Episcopal faith to welcome and assist strangers, especially those who are poor, sick, and most in need of help. Five refugee families who had already booked flights to the U.S. when the Executive Order was issued had to abruptly cancel their travel plans. Episcopal Diocese resettlement workers have been working around the clock to address the needs of these and other families thrown into crisis and to respond to urgent concerns from their loved ones already in the U.S. Representing the Plaintiffs are ACLU-WA Legal Director Emily Chiang and ACLU-WA cooperating attorneys Lynn Lincoln Sarko, Tana Lin, and Amy Williams-Derry of Keller Rohrback LLP.